If you’ve ever wished your pedestal sink were more sculptural, here’s a great solution. The Night Sink from Cagliati…Cogliati is made from 10mm thick tempered glass set on a stainless steel pedestal. The inner block, which is removable, comes in either 4mm colored glass or stone. 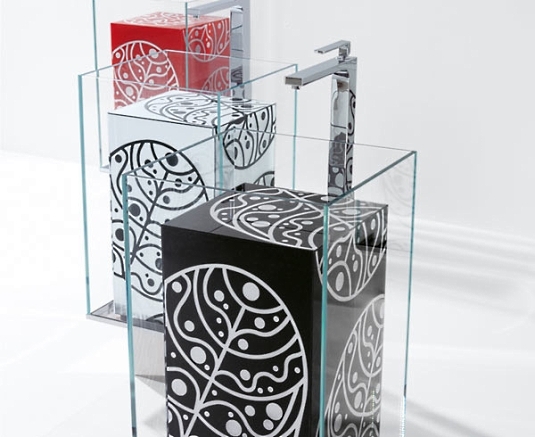 The free-standing floor mixer makes it possible to place the sink anywhere in the bathroom for a bold artistic statement. The washbasin stands 85cm (~33 1/2″) tall by 42cm (16 1/2″) deep. Next PostNext Is that a BMW in your kitchen?